Call to Action: 14-24 October - Free Georges Abdallah and all Palestinian prisoners! Call to Action: 14-24 October – Free Georges Abdallah and all Palestinian prisoners! 24 October 2017 marks the 33rd anniversary of the arrest of Georges Ibrahim Abdallah, revolutionary Lebanese Arab Communist struggler for Palestine, by French police. Since 1984, he has remained behind bars, one of the longest-held political prisoners in the world. From 14-24 October 2017, Samidoun Palestinian Prisoner Solidarity Network joins organizations in France and around the world to call for a week of international actions to demand freedom for Georges Ibrahim Abdallah and all Palestinian prisoners! Georges Abdallah has been committed throughout his life to the revolutionary struggle in Lebanon and the liberation of Palestine. He was involved with the Palestinian leftist organization, the Popular Front for the Liberation of Palestine, resisting Israeli attacks on Lebanon. Later, he joined other Lebanese revolutionary leftists in the Lebanese Armed Revolutionary Factions, pointing to a non-sectarian, socialist and revolutionary path to liberation for the people of Lebanon, faced with civil war militias and Israeli invasion and occupation in the south of Lebanon. Georges Abdallah was originally arrested for allegedly carrying false documents; his detention was repeatedly extended as French intelligence searched for information to charge him with involvement in armed actions that killed a U.S. diplomat and an Israeli representative in Paris. Even one of his lawyers was reportedly involved in spying on Abdallah for the French intelligence agency. While he was supposed to be exchanged with prisoners held by Arab revolutionaries, the French state reneged after obtaining their own prisoners, keeping Abdallah as a prisoner. In 1987, when Georges Abdallah was sentenced, he was expected to receive a lengthy sentence of ten years or less – as recommended by the prosecutor in his case. Instead, he received a life sentence, as argued by a private lawyer representing the U.S. government. Today, Georges Abdallah remains behind bars. Despite being eligible for release since 1999, his applications have been denied repeatedly. Even when they have been approved judicially, French officials have intervened at the highest levels to block his release, such as former Prime Minister Manuel Valls. U.S. officials like former Secretary of State Hillary Clinton have also intervened in an attempt to block Abdallah’s release. In essence, Georges Abdallah is a prisoner not only of the French colonial state but also of U.S. imperialism and the Israeli occupation. Meanwhile, the Lebanese government has failed to live up to its responsibility in seeking the freedom of its imprisoned countryman. Despite being held in Lannemezan prison for over 33 years of his life, Georges Abdallah is an active participant in struggle. He has written letters and issued statements in response to revolutionary struggles around the world and always maintains a special eye toward the Palestinian prisoners, who have declared him one of their own. His words continue to inspire generations of revolutionaries, strugglers and freedom fighters. And his participation is not limited to words – indeed, he has refused meals and organized his Basque and Arab fellow prisoners in Lannemezan to do so as well, in solidarity with the hunger strikes of Palestinian prisoners in Israeli jails. We are chained by the common injustices manufactured in the United States of America, which are the same ones used in Palestine, and I do not doubt that there are many examples in all of the strongholds of imperialism. You and those who unite with you in support and solidarity, the true comrades in France, Lebanon, Palestine and all over the world, are the natural extension of those who once carried hammers, stormed the Bastille and broke into the prison walls…the extension of those who turned the cells of the Zionist occupation into revolutionary schools from which successive generations learn the meaning of will, determination and commitment…the extension of all of the forces and movements for liberation in the world who resist for true democracy and a world free of exploitation, tyranny and subjugation, where the values of social justice, liberation and dignity prevail. Until we meet one day in the world of freedom, you remain a symbol and a model for us to follow. This year, on 14-24 October, we call on you to join us, in your cities, communities, neighborhoods, camps, towns and campuses, to organize events, protests, marches and activities to demand freedom for Georges Ibrahim Abdallah and all Palestinian prisoners. Events are already being organized in France, including the mass annual march to Lannemezan prison, in Ireland, in the United States, in Germany, in Spain, in Belgium and in Lebanon, Jordan and Palestine, among other locations. 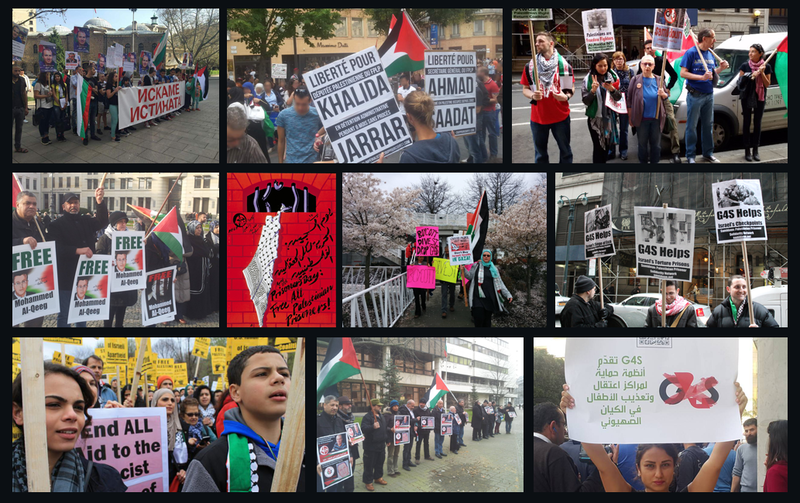 Georges Abdallah is not alone; his imprisonment comes alongside that of Ahmad Sa’adat and over 6,200 Palestinian political prisoners in Israeli jails and the prisoners of Palestine in U.S. and other international jails. They are imprisoned in an attempt to silence and suppress the anti-colonial struggle of the Palestinian people for justice, liberation and return – yet their leadership remains a symbol of hope and inspiration to all those who struggle for freedom. Join the movement to free Georges Abdallah, free Palestinian political prisoners and free Palestine, from the river to the sea! 2. Join the broad national protest in Lannemezan on 21 October. Every year, hundreds arrive to demand George’s freedom, raising a call so loud the prisoners can hear us inside. Don’t miss this year’s action! Free Georges Abdallah! Free all Palestinian Prisoners! Palestine: They can’t stop our solidarity! Free Georges Abdallah and Salah Hamouri! Protest – Free Georges Abdallah!